Tiny little Corsican Mint packs a great big punch. One of the strongest tasting of all mints, it is also the smallest. Unlike most mints it can be difficult to grow. The Corsican Mint plant in the picture above is growing in morning shade and afternoon sun and gets water every day---sometimes twice a day during our hot summers. For this section, three-inch pots were planted about three inches apart in early spring. Four months later the area is well on its way to being covered in Corsican Mint. 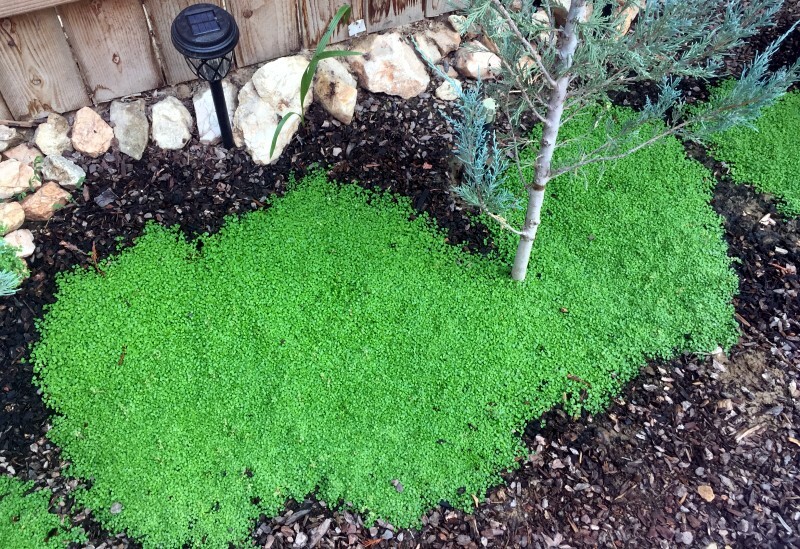 We are often asked how far apart to plant creeping ground covers and this is a perfect example of economy versus time. Given enough time one three-inch pot would cover the entire area. Planting them closer together costs more but covers faster. We don't really use Corsican Mint for cooking but it is wonderful to run your hand across and take that scent with you on your skin. 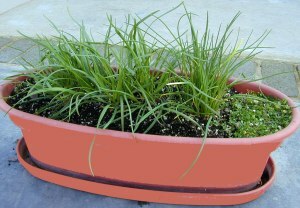 The Corsican Mint plant in the planter on the right is growing happily along with Chives and Garlic Chives. Corsican Mint flowers are a soft lilac. Needless to say they are tiny. They are also few and far between. This plant is often available in plug trays. These trays hold 128 of all the same plant. They are a great low cost way to fill a lot of space. Each cell is 3/4 of inch by an inch. Check here to see if Corsican Mint Plug Trays are available.